Posted on Sun 25 Sep 2011 at 11:08 PM PST. Filed under Recipes. I decided to take it upon myself tonight to cook some Greek moussaka, almost the way my mom in Greece makes it, with a real bechamel. There’s not one person that has eaten my mom’s moussaka in Greece and hasn’t commented that this is the best moussaka they ever had. It’s that good. My version came out delicious, and my husband said that it was as good as my mom’s — which is a huge compliment for me, since this is my mom’s “signature recipe”! So here’s my Paleo version of it, which simply substitutes potatoes for zucchini, milk for coconut milk, and wheat flour for coconut & almond flour. Everything else is the same as in the original Greek recipe, and so the flavor is almost the same. One could also substitute the meat for mushrooms, and the butter for coconut oil to make it veg*an. Be aware though, preparation takes 1.5 hours! A lot of work for sure, but you won’t regret it! 1. Cut the two ends from both zucchinis & eggplants, and discard these ends. Hold them vertically, and also slice them vertically with a sharp knife to about 1/3 of an inch thick (~1 cm). You can also use a mandolin to do this, but make sure the slices are not coming out too thin. Your vertical slices should look like in the pictures. 2. 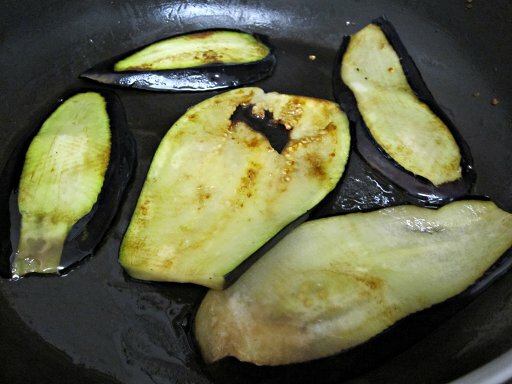 Pour some oil in a frying pan, and fry the eggplant slices in medium heat. Make sure you don’t overload your frying pan, all slices should be “touching” the bottom of the pan. Eggplants “drink” lots of the oil, so replenish as needed. Turn the slices once or twice. Remove and set aside when the slices are wilted, and have started taking some nice color (do not overcook them). Do the same for the rest of the eggplant slices. 3. Do the same as above for the zucchini slices too. 4. In a cooking pot add a bit of oil and the chopped onion. Cook in high heat. 5. When the onions are wilted, add the minced meat. 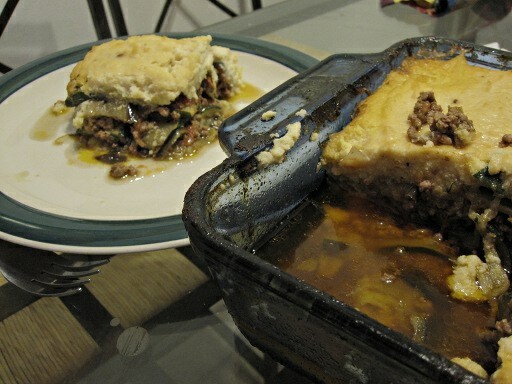 Stir quite a bit so the minced meat becomes “unclogged”. 6. Add the chopped parsley, minced garlic, and the chopped tomatoes. Ground some black pepper. If you’re using the optional basil or salt, this is the time to add them too. Stir. 7. When most of the tomato moist has evaporated and the sauce has thickened, turn off heat and set the pot aside. 8. Preheat the oven at 410 F (~210 C). 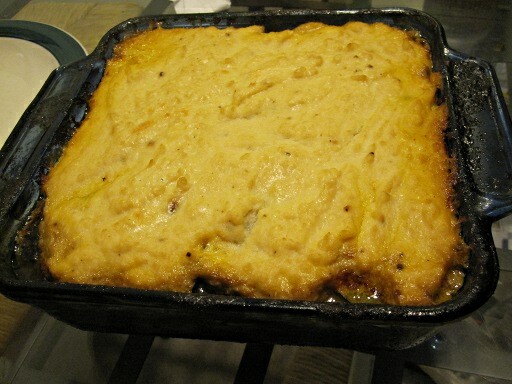 Use a rather tall, and about 10″-sized baking dish. 9. Take some eggplant slices and cover the bottom of the dish in a horizontal manner. Then use some more eggplant slices and put them in a vertical manner (so they criss-cross each other). 10. 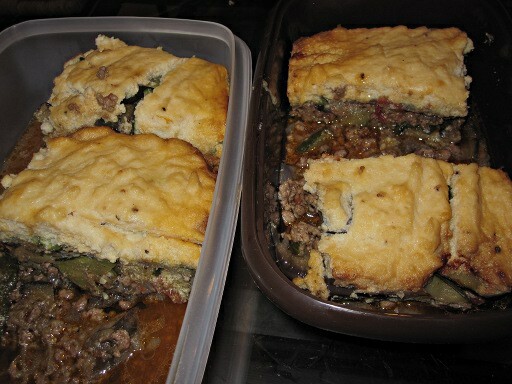 Pour half of the meat sauce on top and spread evenly. 11. 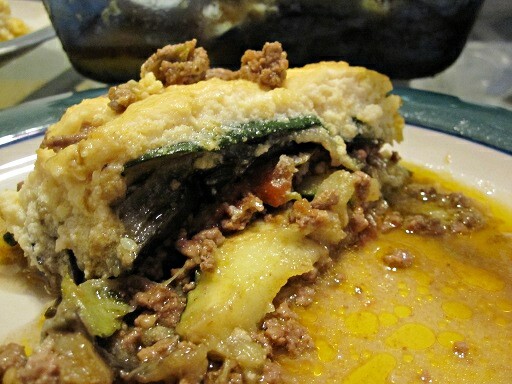 Take zucchini slices and use them on top of the meat the way you did for the eggplant. 12. Pour the rest of the meat sauce and spread evenly. 13. With the remaining eggplants and zucchini slices create one more layer. 14. In another pot add the coconut milk, butter, egg, and coconut & almond flours. Ground some black pepper, and add the paprika. If you’re using the optional parmesan, add it now too. Using a whisk stir everything under medium-to-high heat. 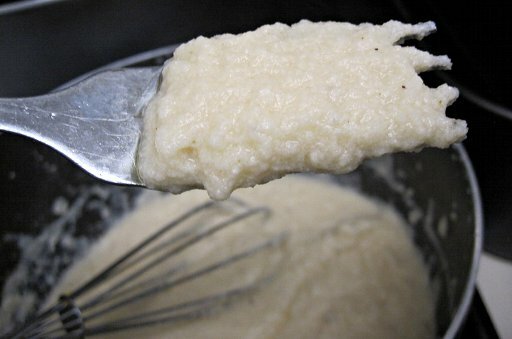 You need to be whisking constantly, or clumps will form. 16. Pour the bechamel on the top layer of your baking dish, and spread it evenly using a butter knife. 17. Bake for 45 minutes, or until the top has started getting some nice brown color. 18. Eat warm and enjoy. Left-overs microwave well, and they also freeze very well too.